Doug Shields was an ace defensive centerfielder for Ron Fraser's Hurricanes from 1981 to 1984 and was equally impressive with his bat. In 1984, Shields won the Sun Bank Trophy (UM's MVP as voted by the Miami coaches), the Arnold Novens Memorial Trophy (UM's MVP as voted by Miami fans), and the Tony Roma's/Ron Fraser Post Graduate Scholarship Award (for superior achievement in academics and athletics). When he was inducted, he owned the school records for career games (284), career stolen bases (123), and most consecutive games played (284). 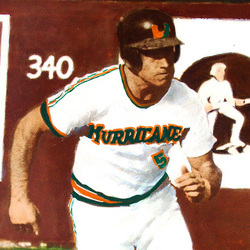 Shields, a key member of the Canes 1982 National Championship teams, ranked 2nd on Miami's all-time list for career at-bats (871), career runs scored (238), runs scored in a single season (82), and career hits (271). The Tampa, Florida native is third on UM's all-time career walks list (189) and finished with lifetime .312 batting average, 22 home runs and 182 runs batted in. Shields was selected by the Montreal Expos in the 1984 Major League Baseball draft. However, a knee injury cut short his pro aspirations. He currently works in a family-owned roofing business and lives with his wife Vicki in Tampa.